These guideline amounts are a starting point, and your puppy might need more food depending upon age, activity, and temperament. 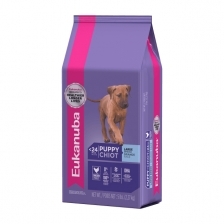 In order for your puppy to reach optimal body condition, you might need to adjust your puppy’s food intake. This represents the total recommended volume of food per day. You should divide the total recommended feeding amount by the number of times you feed your puppy per day to get the actual portion size per feeding. Feed this food to: large-breed puppies (51 to 90 lbs. at maturity) 1–12 months or giant-breed puppies (over 90 lbs. at maturity) 1–24 months. Remember to have clean, fresh water available for your puppy at all times. 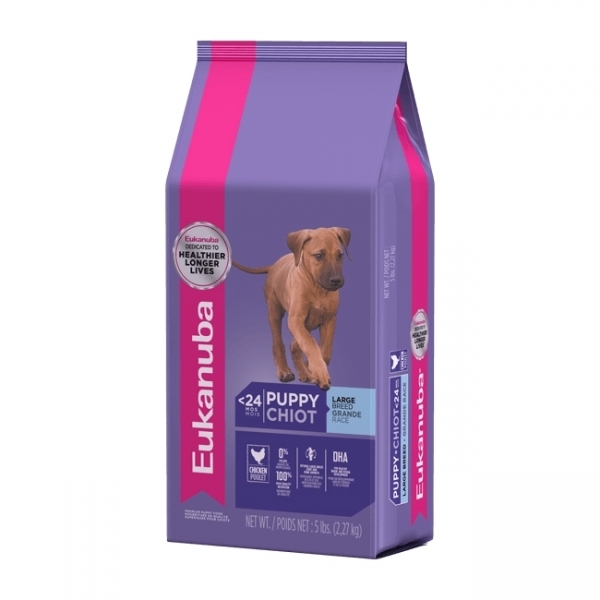 Because EUKANUBA™ Large Breed Puppy is complete and balanced for growth, you do not need to add vitamin or mineral supplements. NOT RECOMMENDED for feeding during pregnancy and nursing due to specially adjusted mineral content. Safe Handling Tips for any Pet Foods and Treats: Please wash your hands before and after handling any pet food or treat. Wash pet food bowls with soap and hot water after each use. All product images shown are for illustration purposes only. Actual products may varies in term of size, type, brand, version, colour, and other relevant characteristics.